Believe it or not, I really get pleasure from food shopping at the weekend. It usually leads to a wander up to the Asian food market. Sometimes I take a direct trip there in fact, because food shopping at the supermarket can be rather expensive at times. Since most Asian food is simply rice, a very low volume of meat, some veggies and sauces with lots of flavor, it can be a real money saver. On my venture, the thing I didn´t pick up however, was the main ingredient(!) - chicken. I don´t know how I forgot it, but prawns worked as an alternative. 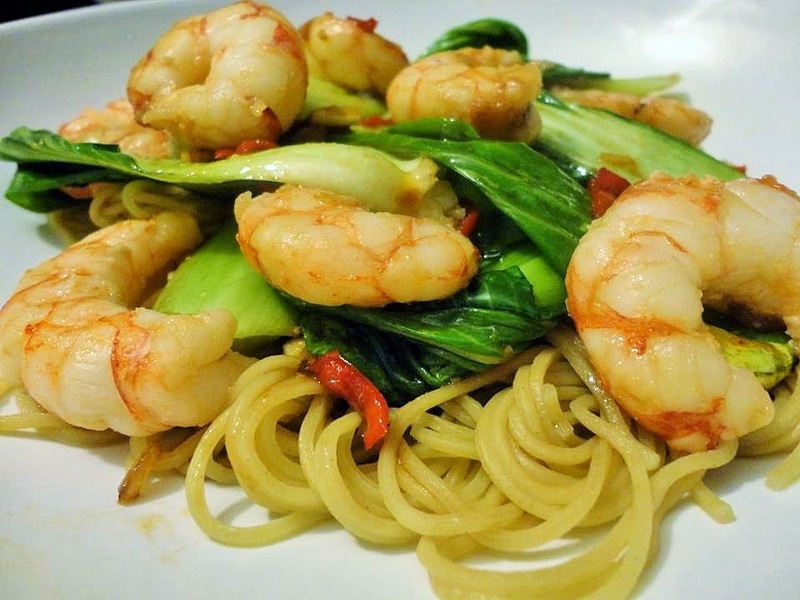 I didn´t marinate the prawns beforehand as I would have the chicken, but the end result is still great.. Savory, spicy, and tangy with a hint of sweetness and some bite from the pak choi. 1. Heat the oils in a wok or large frying pan over a high heat. 2. Add the onion, garlic, ginger and chilli and stir-fry for 3–4min. 3. Add the pak choi and teriyaki sauce and stir-fry for a further 2 min. 4. Add the prawns last, only to heat them, mixing in the flavors of stir-fry.